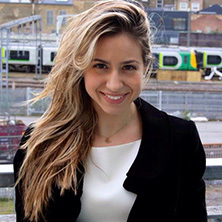 Elli Aidini Antonopoulou has successfully completed the specialist LLM in Maritime Law. Apart from taking on the necessary modules for the completion for the course, Elli also took on two additional modules in the field of Energy Law. Coming from Greece, which has a strong and excellent tradition in shipping, I had a big admiration for the sea and I was keen on understanding how the shipping industry operates. Therefore and in order to pursue this goal that I had set, after graduating from Law School in Greece, I started working as a trainee lawyer in a law firm specialising in shipping law in Piraeus. One of my tasks was to perform a case law research on the subject of compensation awarded for salvage operations by English versus Greek Courts. It was at that moment the salvage bug bit me and I knew I wanted to acquire more specialised knowledge in Admiralty Law. What made you choose City, University of London and The City Law School? City, University of London was an obvious choice for me, since it has a long tradition, strong connections with the industry, as well as it is established in London, which is a vibrant, dynamic metropolis of the world. Moreover, City Law School has many advantages. To name a few, it offers a vast array of modules. In my case, Admiralty Law, Carriage of Goods by Sea, Marine Insurance & International Trade was part of the core programme. Nevertheless, there were only some of the available modules that City Law School offered to someone interested in maritime law. In addition, it is the only University that offers specialized LLM but grants its students the opportunity to follow modules from other fields of law. For me, that meant I had the opportunity to delve with both marine and energy law modules. Last, but certainly not least, City has received excellent recommendations from former students. Describe in a few sentences your experience at City in general? Even if the studying is intense, it is highly appreciated and rewarded by the School, which makes it exciting. To be more precise, I wrote one of the best essays in Admiralty Law and won the prize of participating on the International Salvage Union Conference, where I met the CEO of the company I am currently working. Nevertheless, thanks to City's highly multinational environment I had the opportunity to make solid friendships with people from all around the world. Overall, it has been one of the most productive years of my life. The faculty personnel are highly trained and easy to approach. They were always happy to provide us with guidance and support throughout the course, as well as with additional studying materials. Furthermore, the faculty organised seminars in which distinct personalities from the shipping industry shared their experience and insights and allowed us to make productive discussions and get a further understanding of the practice area. For instance, I have had the opportunity to meet Mark Hoddinott, General Manager of the International Salvage Union. Another fact, which proves that the faculty personnel cared about our development, was the fact that once per week we met with the Director of the LLM, professors and staff of City Law School, which allowed us to share our enquiries in such an informal forum. In addition, City is filled with state-of-the-art libraries with amazing librarians, that are ready to help you with complicated legal researches and grants you access to the most prominent legal databases. Whilst studying I had the opportunity to participate, as a volunteer, in organising the 5th Maritime Law and Policy Postgraduate Research Conference. I am a Legal Assistant in Svitzer Salvage B.V, which is the leading company in salvage operations and is also member of A.P Møller Maersk Group. What advice or tips would you give to anyone who wants to study on the LLM Maritime Law? I would advise students with a civil law or non-legal background to study as much case law as possible. Just go to the library or online in Westlaw and start reading cases so as to understand Common Law and the mind-set of Common Law judges and lawyers. Moreover, I highly recommend all future students to participate in City's workshops regarding preparation for job interviews and PLI Tests. Other than this, my only advice is to enjoy the ride.